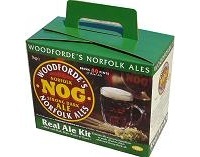 Woodforde's Norfolk Nog (4.6%) is a smooth, reddish-black, rich and yet rounded 'Old Ale' with a smooth velvety texture. Norfolk Nog beer oozes dark and sweet roast malt flavours, which includes hints of chocolate, liquorice and treacle. The flavours really come through when they are set against the very subtle hopping that characterises Woodforde's Norfolk Nog. You can use the equipment from both the BrewBuddy and Micro-Brewery starter kits to make this beer.